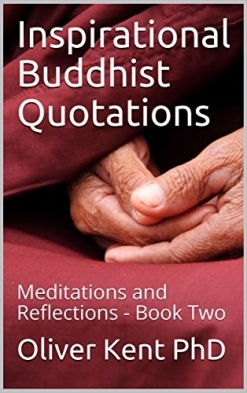 Inspirational Buddhist Quotations: Meditations and Reflections, Book Two is a second collection of one hundred Buddhist quotations paired with reflections or meditations on each quote. Compiled by Oliver Kent, PhD., the messages found in the quotations and the meditations are always warm, positive, and supportive as well as thought-provoking. Each selection is fairly short, allowing the reader to read them all in one sitting or to read and savor one or more a day, consecutively or randomly. The concepts expressed in the quotations are easy to understand and identify with no matter what the reader’s religious or spiritual background and beliefs are. They address the human condition and what we can do to make life more loving for ourselves as well as for others. Common sense abounds, as does a positive perspective - and sometimes even a touch of humor - which will likely bring new insights and ideas to readers. I have very much enjoyed both volumes in this series and plan to come back to them often for reminders and ideas. 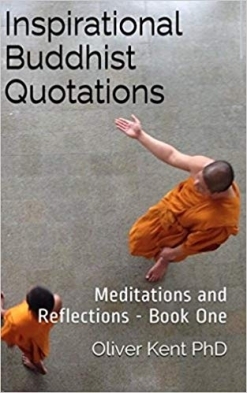 Inspirational Buddhist Quotations: Meditations and Reflections, Book Two is available on Amazon in paperback or Kindle editions. More reviews of Oliver Kent, PhD.